The Silverberg Leadership Award, created by EL Education Board Member Irwin Silverberg, is given to an exemplary school leader who has raised student achievement through deep implementation of EL Education practices. 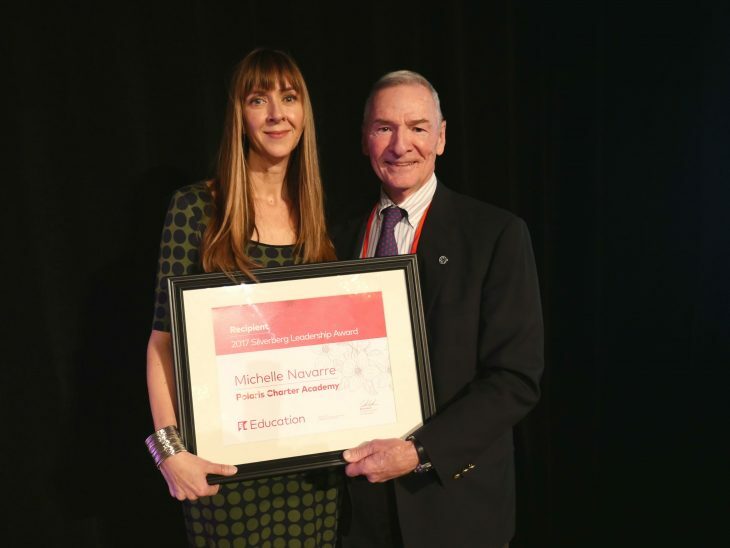 Michelle Navarre, Head of School of Polaris Charter Academy, a K-8 EL Education Credentialed School in Chicago, has received the Silverberg Leadership Award in recognition of her leadership and successful implementation of EL Education pedagogy and culture, fostering outstanding student achievement. She received the award on October 27th at the EL Education 25th Anniversary National Conference in Chicago. Watch Michelle’s full speech here. Catalyze positive leadership as a shared function in EL Education schools from teachers, parents, and students. Inspire teachers and students to embrace the EL Education culture of quality and collegiality. Create an atmosphere of engagement and high standards for both learning and character. Set a “higher bar” for and recognize excellence among teachers and students. Encourage innovation while providing teachers the means to explore outstanding practices employed in the EL Education community.